Over the Rainbow: Ella Blog Hop! Ooo... I miss reading while commuting too! Now that I walk to work (I live that close), I don't read enough! I've missed my stop numerous times cos I was too engrossed in the book. Cute page! LOVE your layouts, as always, Keshet :) Life does change so quickly even when it seems so ordinary. Happy first day of Spring! LOve the layouts. I need to do this more. I get caught up with trying to document certain feelings/events/moments. I want to get the facts & the story down but I need to just do a regular everyday moment as well. I know I will appreciate it one day. Thanks for the opportunity to win. Love these everyday moments you have captured! Thanks for sharing! I'm interested in doing a "day in the life" layout. Gonna have to grab my camera tomorrow! I love your layouts & have to check out these online pubs (sent here from 2p's ipad thread! :) ) I love your layouts! I really like your day in the life layout! Love your layouts ~ I wish I had photos from when I commuted to work but I can still capture those thoughts on a layout without them. Thanks for the inspiration and for the chance to win! Great ideas! I want to so some screen captures of my kids text messages and scrapbook those. I want to scrap an hour by hour rundown of our day before the new baby gets here. 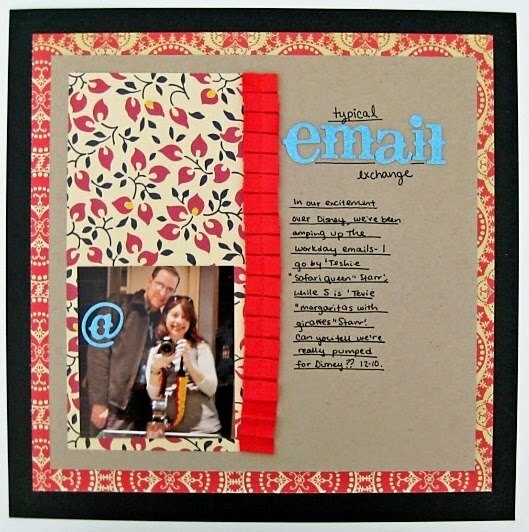 Love the idea of scrapping emails with the hubby. It's wonderful that you are documenting your lives together before you have kids! I wish I would have done that. It's such a special time, and quite easy to forget once the little monkeys do come along! Thank you for sharing your life with us! I want to do a layout about coffee, since I drink it all day long! Hah - love the idea of doing a typical email exchange. I can see using this for a typical fb exchange between my daughter and me. Awesome inspiration, thanks! I too have caught the "capturing every day" bug, and I love it. I find it makes me more likely to scrap about myself and my husband too. I took photos and journalled for a Week in the Life last year but haven't yet put the layouts together. I need to get that done because I really enjoyed the process of doing it. It'll be so neat to look back on! 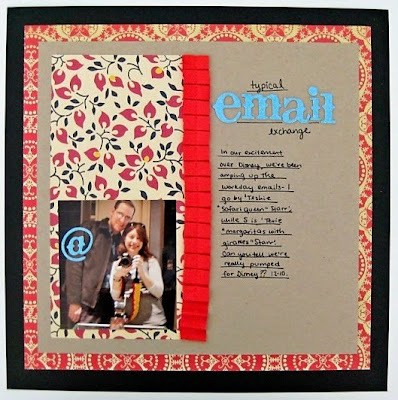 What a great idea, I always wonder what to scrap since I havn't been on vacation or have kids. i so love your everyday pages! I do scrap the everyday moments regarding the kids, they say and do such cute things that I don't want to forget. I haven't scrapped any ordinary days or moments about me and my day. Guess I never thought it was that important. Thanks for the inspiration! We don't have kiddos yet either, so it was good to see someone applying this to their non-child life. These are all great layouts! I love the topics. I definitely need to do a day in the life page. beautiful pages and I love the topics you chose!!! Love your pages! 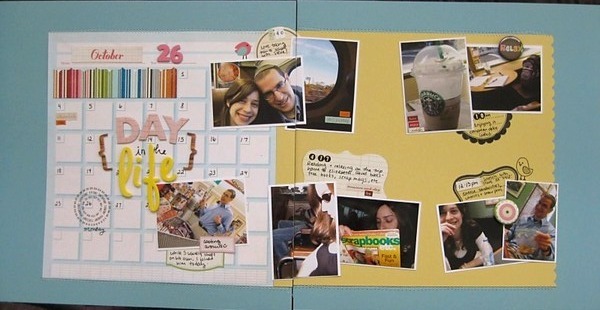 I really need to start scrapbooking more everyday things like this! Oh my gosh, I post all the time on your blog and had no idea you were part of Ella! I scrap everyday stuff all the time, and do you want to know why? Because kids remember their birthday parties and holidays, but it's the everyday stuff that they probably forget. Think back to your childhood, I'm sure the big events you remember. Thanks for the chance at the book. Great everyday LOs! I like to do the everyday ones, they are my favorites. I have a few on my list to do, including one about Facebook status updates. thanks for the chance to win. Love the calendar double! Great pages! Hey, I love your style. Great blog header. Fantastic layouts! Love your everyday layouts! That's the stuff future kids will enjoy reading and seeing! I have done a few layout's of everyday things and I must do more.Thanks. LOVELOVELOVE all your layouts! Thanks for a chance to win! I like the "A Day in the Life" idea but I just snapped a photo of my son in my rear-view mirror and I'm thinking that I'll do a layout about our drive home from daycare and how we talk about how our days went. I have two teenagers now and in the age of technology and our way of communicating....I'd like to document some of the texts messages they send to me: the good, the bad and the ugly ones :) I just have no idea how to capture the texts short of retyping them in Word....ideas anyone? I do want to remember the everyday moments. They evaporate in my memory if I don't hang on to them. My 6 year old daughter likes to make up her own jokes. I've been writing them down and I want to scrap them all. Love these glimpses of everyday life you have captured. One of the everyday things I should make a page about -- my sons' favorite stuffed pals. I love the idea of this book. I'd like to scrap about how hard it is to work from home! I get so distracted! Love your layouts. Thanks for the chance to win! I love scrapbooking the everyday stuff and your layouts are fab girlie. Nice layouts. I need to scrapbook more routine, daily events of our life. I hope I win a copy of the ebook, so I can get some fun ideas. Thanks for a chance to win. love u'r LOs. I would love to scrap about my exercise routine using my Wii. Love your layouts !! Would lvoe to scrap everyday cyclic chores like laundry,cooking and cleaning ! Would lvoe to win a copy of this book !! I would love to scrap the kids bedtime routines. Thanks for the chance to win! Love all your LOs, Keshet! Loved these Lo's. Last year I scrapped nearly every flower that appeared in my garden, There was a new one everyday. 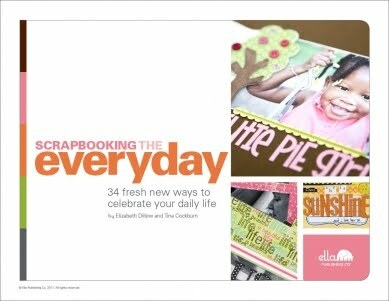 I hope the e-book is an inspiring as your layouts! I'm also one without kids currently, so I love the ideas for everyday moments with your husband and added quite a few to my notebook. THE GIVEAWAY IS NOW CLOSED. I WILL CHOOSE A WINNER TONIGHT. Have a great Wednesday!